Exploring the backcountry and wilderness of the Western USA. 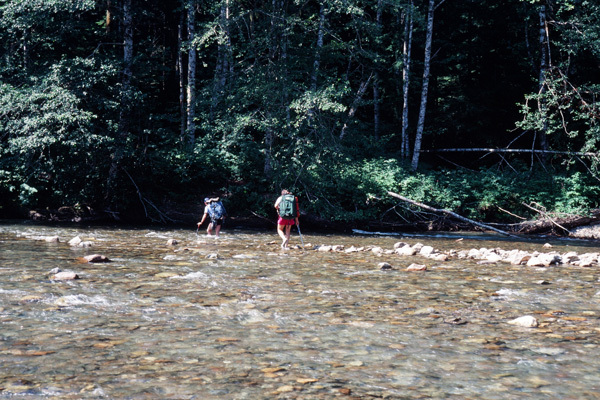 Linda and I met in the Spring of 1990 through the Chemeketans, a climbing club in Salem, Oregon. That summer we started climbing together on rock, snow, and ice. Here I describe some of the mixed climbs we shared while getting to know each other. These were club climbs and I have fond memories of our experiences and those we shared them with. 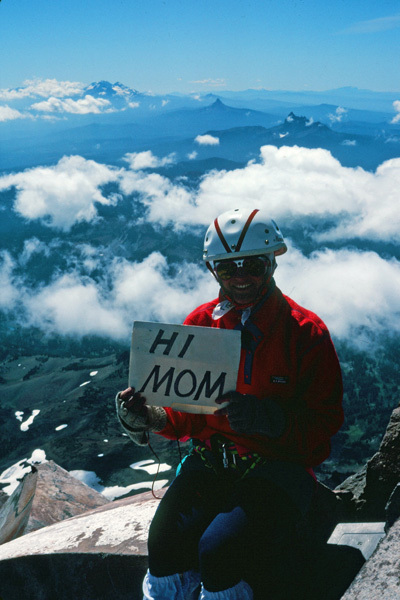 In June of 1990 Linda and I joined Betsy, Nancy, Bill, Darcy, Debra, Leah, Roy, George, and Tom on a Chemeketan climb of Mount Jefferson, the second-highest peak in Oregon. 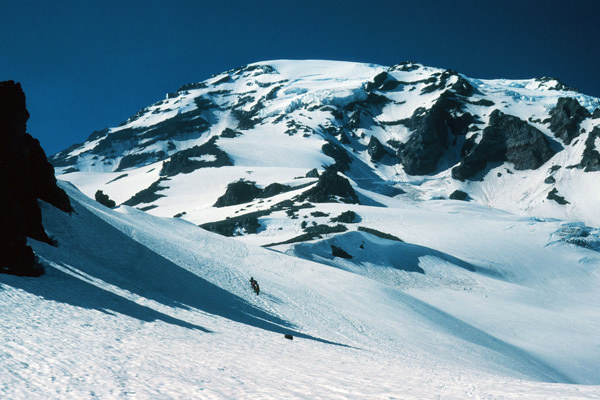 Mount Jefferson takes a quite different appearance from each side and offers some challenging routes on snow, glacier, and rock. Timing can be important. Too early in the season and the summit rock pinnacle can be covered in snow and rime ice making it quite dangerous. 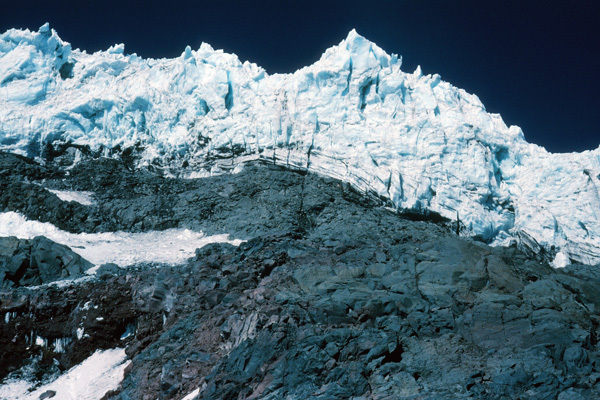 Too late in the season and the glacier crevasses can be difficult to avoid or cross and a steep snow traverse below the summit cliffs can be quite icy. 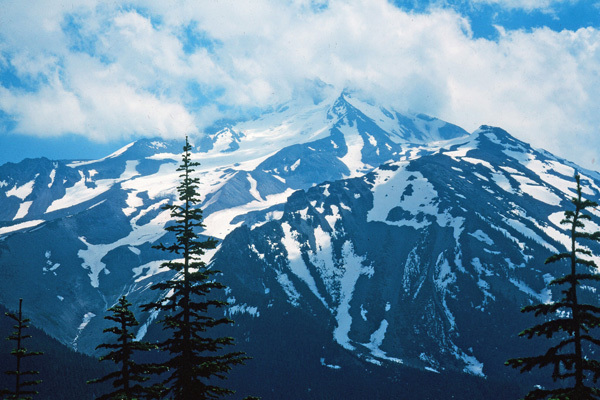 Over the many years my success rate for summitting Mount Jefferson is only about 50%, but I admire that mountain the most of all those in the Oregon Cascades. Linda on the Southeast Ridge. After climbing the Whitewater Glacier we reach the Southeast Ridge. 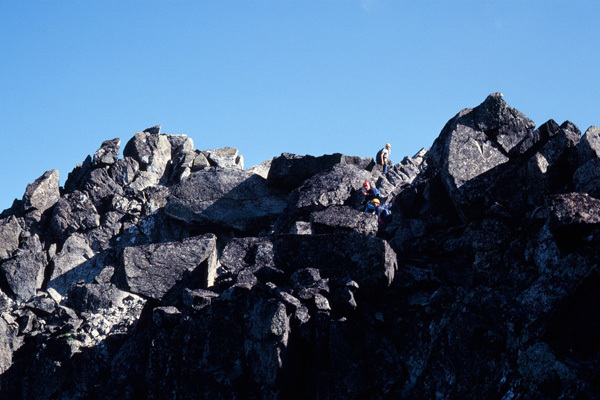 Here we remove our crampons and coil our ropes for the climb of loose rock to the Red Saddle. Mount Jefferson’s summit rock pinnacles from the Red Saddle. On this climb we had to turn around due to high winds and steep loose snow. This can be a heartbreak after so much work to get this close. Linda and I and a few others returned to Mount Jefferson the following September. This time we reached the summit. The summit registry contained this placard. 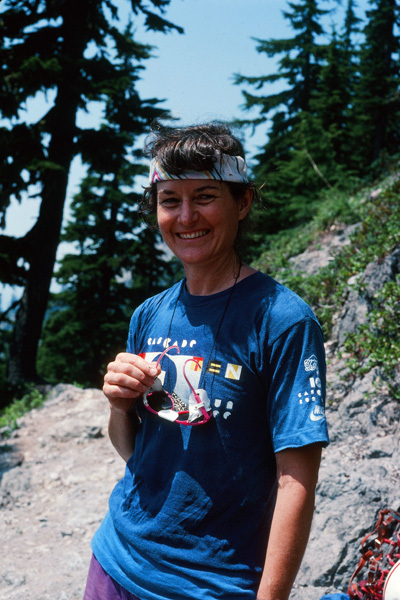 In August of 1990 Linda and I joined Bill, Gary, and Doug on a Chemeketan climb of Sloan Peak in the North Cascades of Washington State. 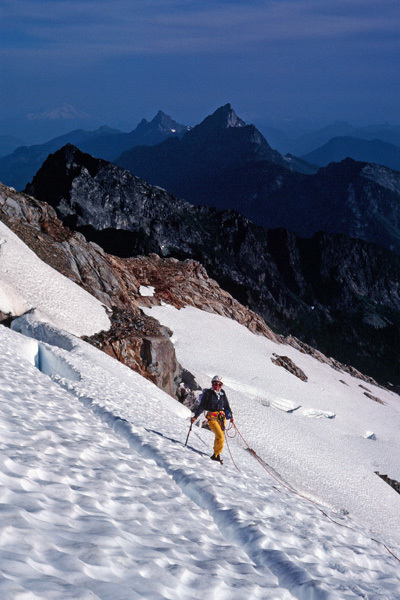 This was Linda’s first trip into the North Cascades, a wild and beautiful mountainous region with steep rock faces and ridges and hanging glaciers. 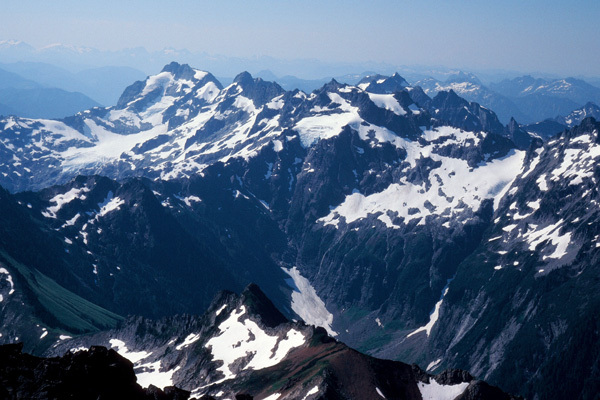 We would return many times to these mountains and build vivid memories of our visits. 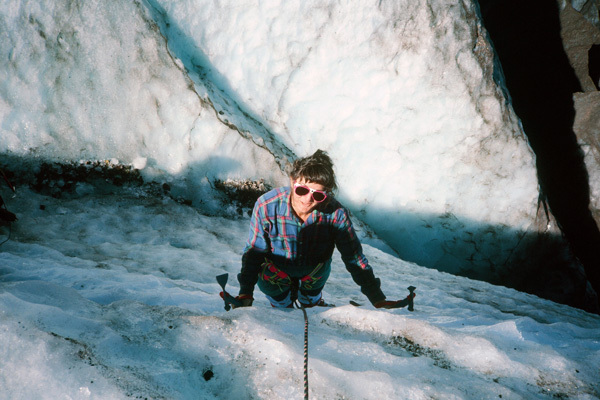 In the autumn of 1990 Linda and I practiced ice climbing and crevasse rescue techniques on Eliot Glacier. 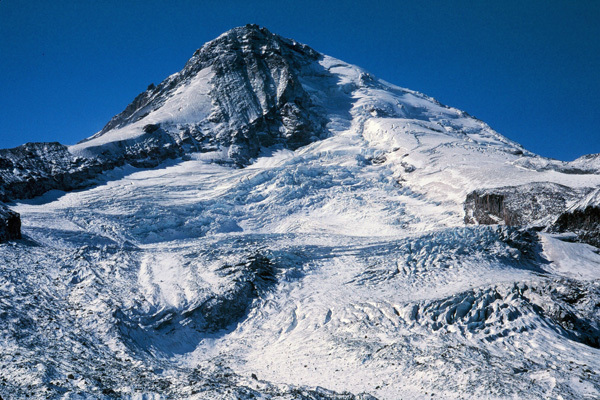 The Eliot Glacier descends the steep north face of Mount Hood and is heavily crevassed. 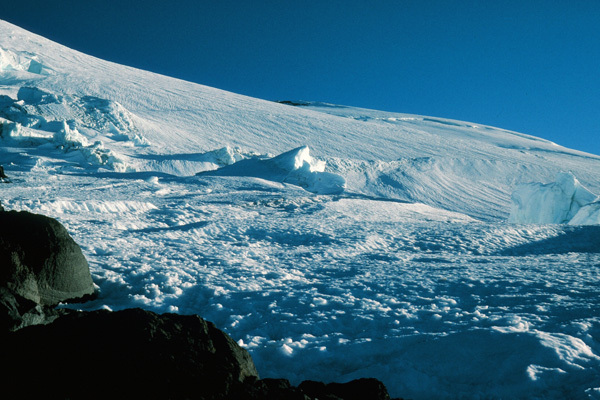 It is an ideal ice playground after the snow melts and the crevasses are open and ice seracs stand exposed. 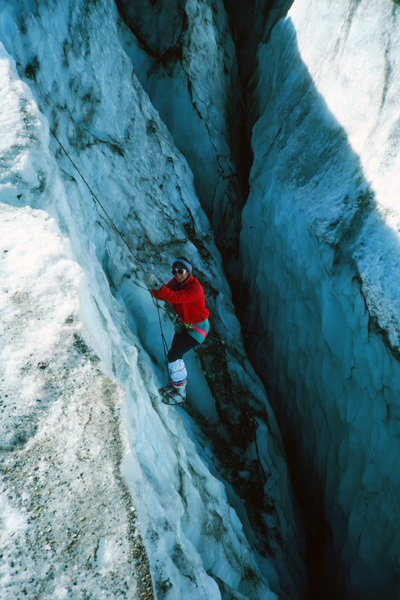 Linda “front pointing” up the wall of a crevasse. She uses two ice tools and the front points of her crampons to climb the ice. Linda “prussiks” out of a crevasse. 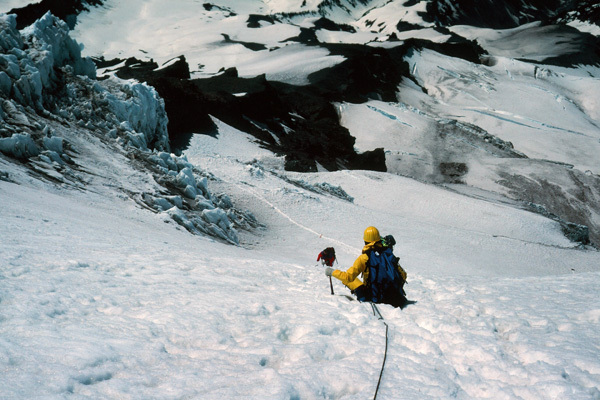 Here she uses a pair of cord loops (prussiks) knotted around the climbing rope to ascend the rope to and over the lip of the crevasse. Perhaps I should have had her on belay in case the cords failed. 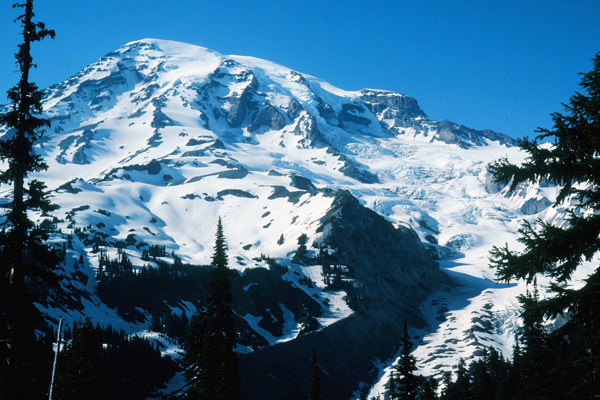 Mount Rainier from near Paradise Lodge. In this view our route crossed the Nisqually Glacier on the lower right from right to left and up onto the obvious ridge just right of center for our first camp. The next day we climbed the broad snowy ridge towards the upper left to just below the ice cliffs for our second camp. The third day we climbed around the ice cliffs up the Kautz Glacier to the summit (14411′), returned and broke camp, and descended back to Paradise Lodge (5420′) and our cars. 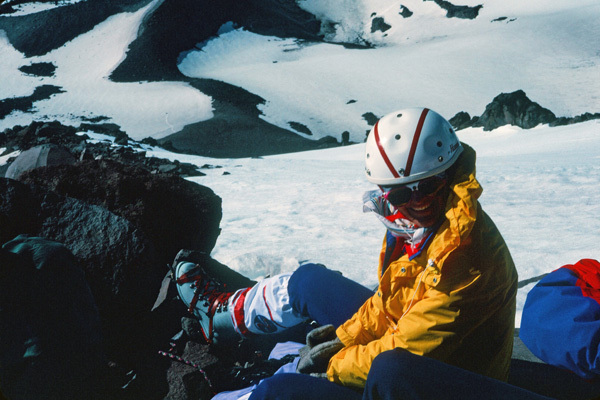 The following July Linda and I joined Ray and Roy and climbed Mount Rainier via the Kautz Glacier route. 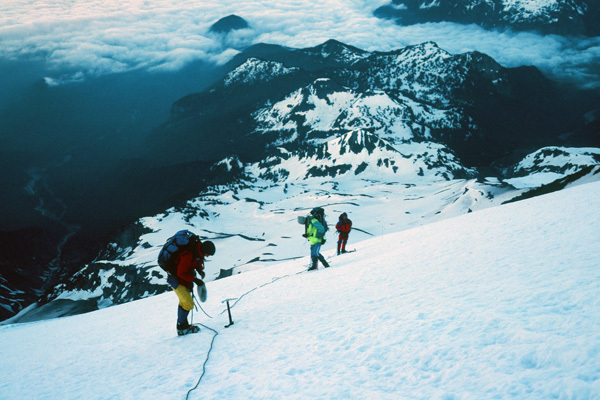 This route avoids the crowds at Camp Muir and on Disappointment Cleaver. 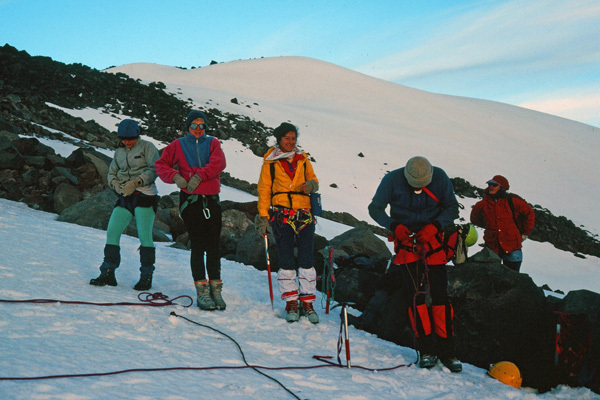 The route includes a scenic high camp below ice cliffs and steep glacier climbing above. We experienced strong and cold summit winds. 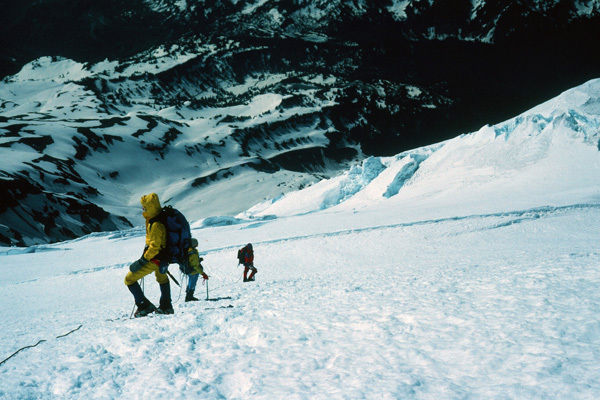 On our unroped descent from high camp Linda lost her footing in crusty snow and slid towards the Nisqually Glacier. Fortunately she was able to stop herself with her ice axe. By the end of the trip Linda was an experienced and proven glacier climber. The view up the broad ridge (“The Turtle”) from our first camp at 7800 feet. 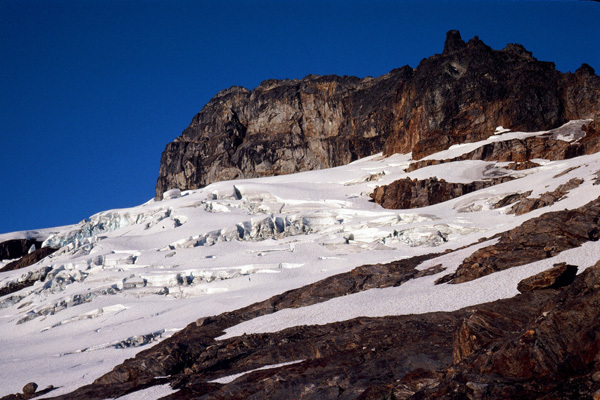 Camp Hazard, the next day’s camp, lies immediately below the Kautz Ice Cliffs above. 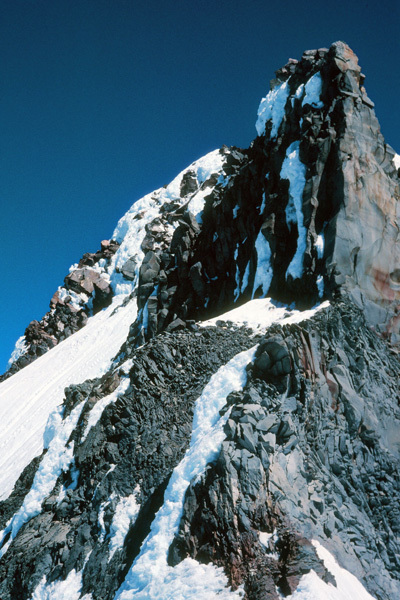 The Kautz Ice Cliffs tower above Camp Hazard at 10800 feet. The fall line takes falling ice off to the left or right from this camp. 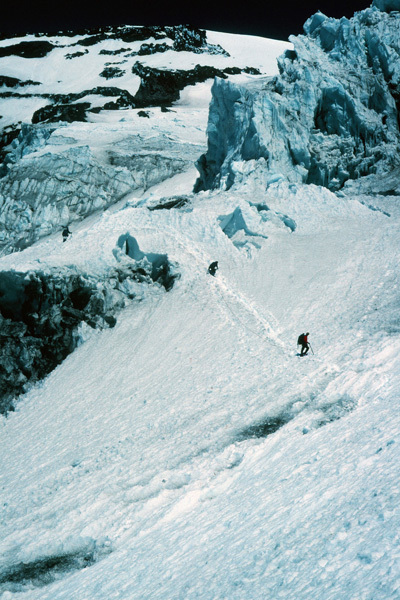 Climbers descending around ice cliffs to leave the Kautz Glacier. Before dawn the next day we would climb up around these cliffs by headlamp and late in the morning descend quickly around these cliffs hoping not to get hit by ice. Looking up the Kautz Glacier from about 13,000 feet. 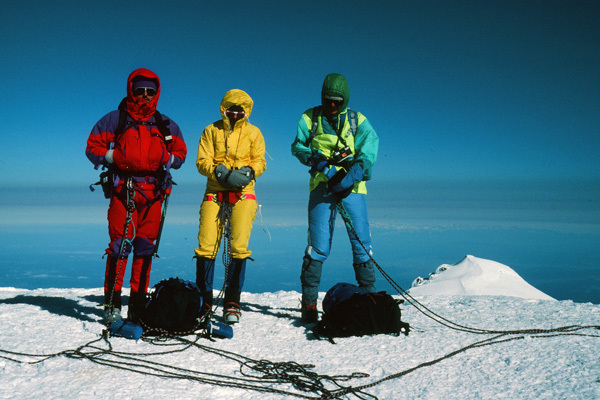 At 14,000 feet the wind grew cold and strong. Descending around the Kautz Ice Cliffs. Linda secures herself while Ray places a picket (a snow anchor) below us. Late in the morning the softening snow can be treacherous here. 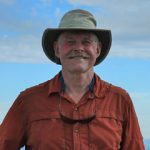 I had the good fortune to have spent most of my life in the Pacific Northwest, where I discovered the joys and addiction of hiking and climbing in the Cascades Range and other ranges in the Western United States. 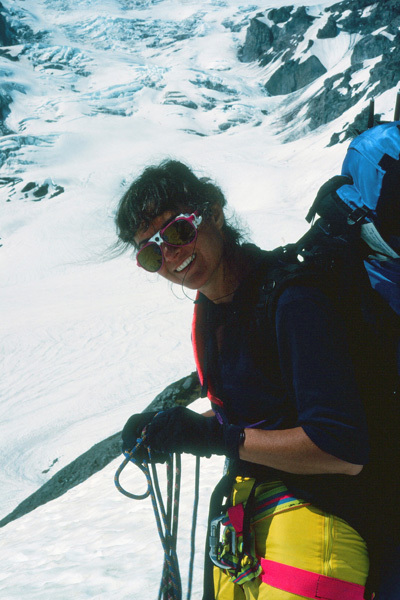 This entry was posted in Climbing, Family and tagged Eliot Glacier, Glacier Climbing, Kautz Glacier, Mount Jefferson, Mount Rainier, Sloan Peak. Bookmark the permalink. Copyright © 2019 Paul J. McClellan.